Former England international Peter Crouch has been impressed with the productive partnership that has been formed by Ashley Barnes and Chris Wood. 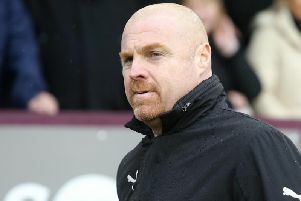 The 38-year-old confessed that he was pleasantly surprised with the quality that Burnley’s front two possessed and he knows that it’s going to take something special to dislodge one of them. The pair have scored 16 Premier League goals between them this season, seven of those since Crouch’s arrival at Turf Moor, and only Manchester City’s all -time record goalscorer Sergio Aguero has outscored Barnes in 2019. Burnley’s leading scorer has netted five times in the last six games in the top flight, including Saturday’s consolation against Crystal Palace. “I’ve been so impressed with both of them,” said Crouch. “I really think they’re two very good players and I’ve been very impressed with the amount of goals they’ve scored, the work that they get through, their hold up play. “I’ve certainly been impressed with both of them. “Those two have been really good and I know my role. “They have been first class since I came in and I have been surprised by just how good they are. For the time being Crouch is happy to play a part when called on from the bench. And he’s made a good impression when thrown in to the action. The FA Cup winner won the penalty that helped seal a point against Southampton, and he almost became only the second player to score for seven different clubs at this level when introduced against the Eagles. Crouch was just inches away from matching Craig Bellamy’s feat in the closing stages of the game, only for Welshman Wayne Hennessey to turn his attempt around the post. He would have been the oldest Premier League goalscorer since Ryan Giggs netted his last for Manchester United against QPR in February 2013, aged 39 and 84 days. Crouch, who was 38 on January 30th, said: “All I can do is make an impact from the bench. “I’ve been involved in a few incidents as a substitute but the biggest impact is scoring a goal. “If not it’s creating chances and being involved. “I’ve done that when I’ve come on. “Since I have been here it has all been plusses. “I think in the last 15 we gave it a right go, and if we had a bit longer we would have maybe turned it round.